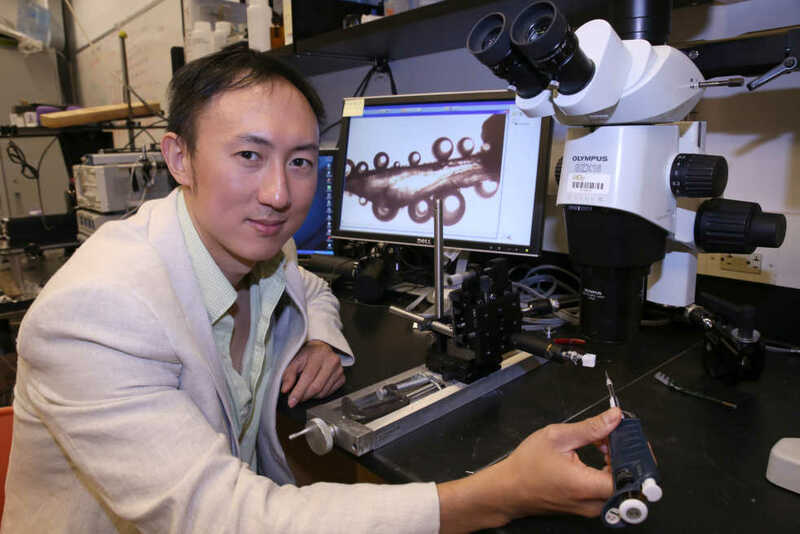 Engineering and Biology and Adjunct Associate Professor of Physics at Tech, David Hu originally intended to pursue a career in the field of creative writing after he graduated from MIT, but instead ended up earning a Ph.D. in mechanical engineering. Like many undergraduate students, Hu was unsure where his passions would lead him in his career. Originally a pre-med student, Hu invested himself in that route working as an EMT and at a phone student counseling service. However, he found that biology on a microscale wasn’t that intriguing to him. He found that studying microscopic subjects had limitations where his current research did not. Studying animals and insects allowed him to use high-speed cameras for analysis and ignore small intramolecular forces. Like his career path, Hu’s work is very interdisciplinary in nature, an amalgam of the fields of engineering, biology and robotics. As a leading researcher in the field of biomechanics of animal locomotion, he works with a range of animals including frogs, elephants, dogs and different insects. “Nature has been around for a while; it requires tools from everybody,” said Hu. His undergraduate advisor was also interdisciplinary, and his first major foray in biolocomotion began as a homework assignment. His project studied how water striders moved and he discovered that the insects do not walk but instead they row on water. That homework assignment blew up in fame and attracted the attention of big media outlets such as The New York Times and NPR. “Since then, my work has been featured almost yearly on The Times,” said Hu. “Discovery Channel comes by once or twice a year.” The “Van Gogh”-esque photograph he took of the water strider on food coloring-dyed water has been featured on the cover of the Fluid Mechanics textbook used at Georgia Tech since he first started as faculty. He has not only been published in high-impact scientific journals such as Nature, but he has also written for Physics Today and American Scientist. Although Hu’s creative writing career is on the backburner, he is still producing content that reaches huge audiences. Hu took his science communication or “sci-com” skills further than the written word and has appeared on numerous television shows ranging from The Discovery Channel to a Chinese game show where he was the only scientist to compete. In addition, after learning Chinese by taking classes at Tech, Hu gave a televised five-minute presentation completely in Chinese. He currently has a book about animal movement for Princeton in the works which is expected to be published in 2018 and an interview with another Ig Nobel Prize recipient that is due to be aired on national Argentinian television. Currently, Hu hopes to establish a science communication class at Georgia Tech, so he can encourage other budding scientists to not only discover the truth, but also to wield it as a tool to educate others.